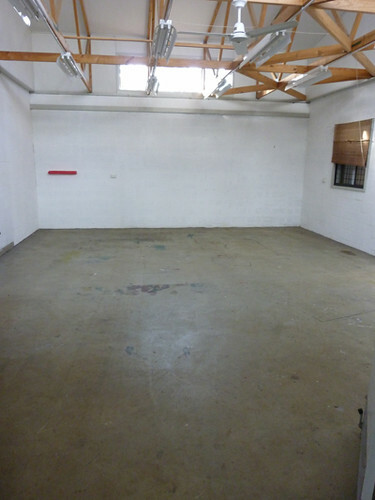 And that's about all the energy I have at the moment, apart from saying that I won't be able to resist the chance to go in to the old space and have a skate tomorrow, before I give it back... look at all that lovely clean concrete! Action stations here! I've been cleaning and painting and shifting and whatever else it takes to clear one space and shift another. 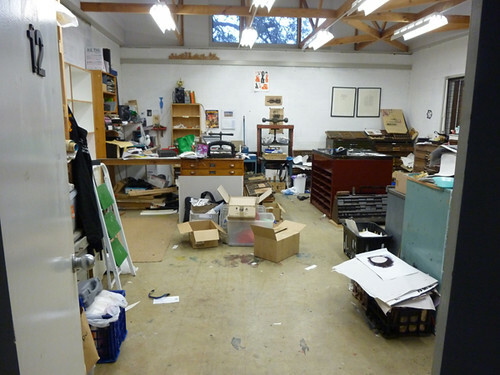 I finally got the home studio (which is a triple garage space) cleared and the walls painted before I went to Sydney for a Print Council of Australia meeting. 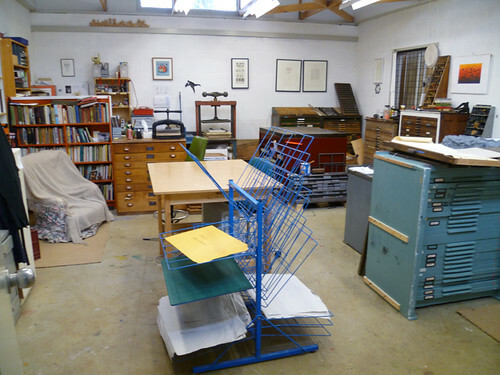 It was in conjunction with the Sydney Printmakers 50th Anniversary, so I met a lot of very interesting and talented people, and also, on the way home, managed to sneak in a quick catch-up with a couple of blog-friends and have a look at Lawrence Finn's fab home studio. When we lived in Townsville in 1980-81, pretty much the only recreation was the local Kirwan skating rink (and of course, it isn't there anymore). I almost lived there, and it was a fantastic place to hang out with my friends, meet boys, hone my skating skillz etc. I never wanted those wussy white girl-skates, always wanted the soccer-boot style, and once I got them, always wanted to be in the speed skating sessions. One of the 'happy places' in my head is zooming around the rink, trying to be faster than everyone else, accompanied by 'I See Red' by Split Enz. I practiced for a while, feeling pretty wobbly at first, but the more I went round my little personal rink, the more confident I got. 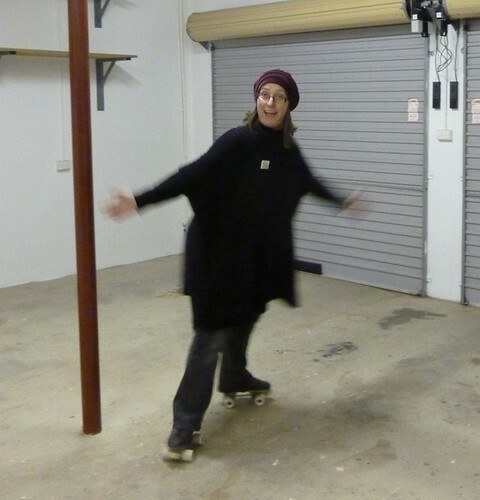 I asked my cousin-in-law, Vince, when he came by last night, to take some photos of me having a skate in my studio. He thought it was pretty funny. He also took a video, but when I looked at it, I thought I could do better; I taped one for myself, and here it is, with a classic 'me' moment at the end, when I tried to be cocky and almost ended arse-up. I will say that at NO POINT in the afternoon did I fall over! I would love to skate more regularly, but the only option these days seems to be to join a roller derby team, and I value my limbs and neck too much to do anything even mildly contacting. 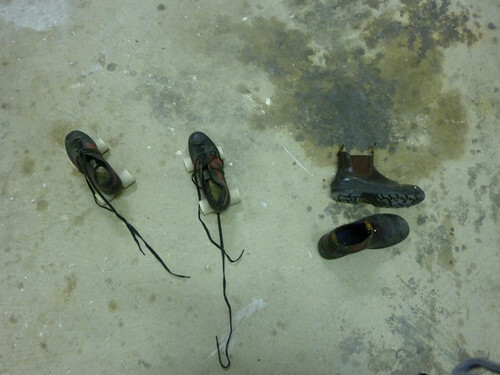 I'm going to get some street wheels, and skate around the neighbourhood, I think. 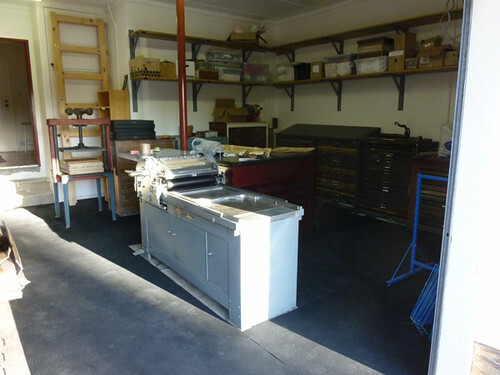 Today I'm laying down recycled-tyre rubber flooring and on Friday the heavy machinery comes in. Goodbye, private rink! The spotlight of attention has spun around and glared in my eyes (in the nicest way). I have been written up in Carolyn Fraser's guest spot on The Design Files. 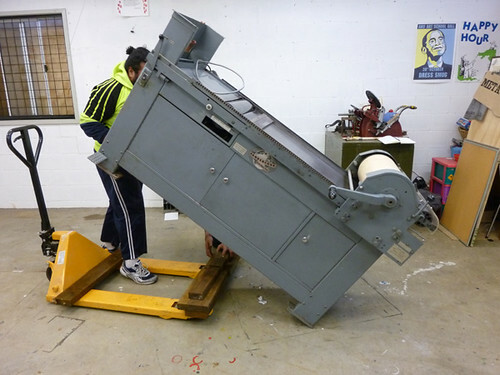 Carolyn, having trained in the US and earned her stripes of excellence, is probably Australia's most experienced letterpress practitioner under the age of 50. 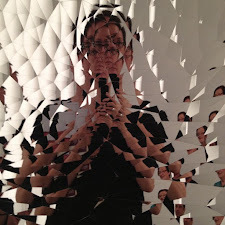 She produces wonderful work and I hope she gets to feature some of it this week in the blog. I can't wait to read her other posts... she's already covered the wedding invite industry and me, what lovely things will she fill the rest of the week with? My heart is pitter-patting. I also overlooked a post written by Meliors, a lovely NZ artist who does a bit of letterpress alongside her main practice, which is, at the moment, making fabulous icebergs from wool and felt. She made a book called 'Response', which was sent all around the world to various interested people who contributed pages, including myself. That link will take you to my page. So there you go. Nice things being said while I beaver away cleaning out my garage and panic about having enough time to get things right before I move the press. I'll leave you with the most personally astonishing cat video... I keep watching it, gobsmacked. Amazing cat! OK, so it's still really windy and cold; this is not a complaint, because I love winter. This particular windy and cold seems to be not fading away, so I'm taking the weekend to recover from teaching rather than launching into clearing and painting my garage in preparation for the studio move, which is mostly next on my To Do list, along with a trip to Sydney next weekend and preparing for my rapidly approaching residency. 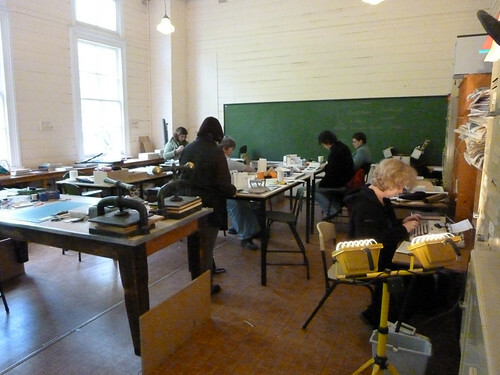 My week at the Sturt Winter School in Mittagong was wonderful. We had the best class you can have (this is not competing with my past fab classes, just an observation): engaged, creative, and generous with each other. I make sure that everyone knows that it's not a competition, and that we are all learning together, because everyone has hidden skills that come out through the week. 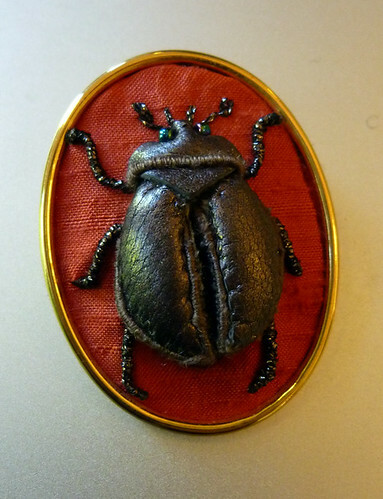 It's a brooch that she'd made of a christmas beetle, sewn using stumpwork and leather... and the wings open up! Clever lady. And Kim, a maths teacher and calligrapher, who invented her own versions of everything I taught and wowed the rest of the class. I took them on a book-making journey from simple concertina structures through Asian stab binding, a basic coptic and culminated in a longstitch sewing onto kangaroo leather. 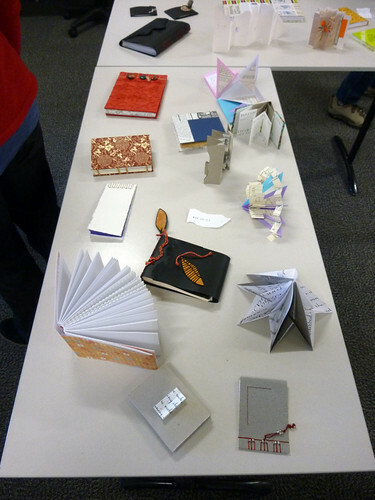 They built up their skills and options, so that by the end of the week they could transform a good idea into an interesting book, rather than only knowing one way to make a book. They worked really hard, often arriving early and staying late to play, and I did have a heavy emphasis on play, because play is what makes ideas progress into objects. 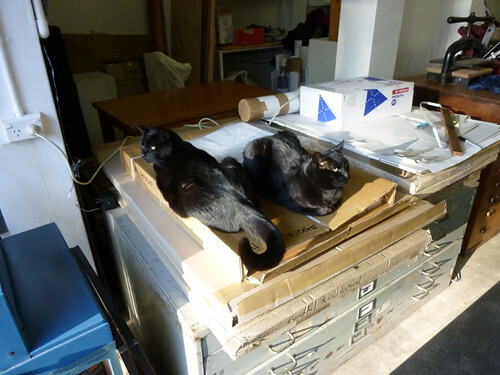 They also, as you can see above, organised the space/s we were given to maximise both room and warmth and light. Along the way we had scary winds outside the window, and we all worked out how to walk from our little Agriculture Studies Cottage to the dining room without walking under big trees, not an easy feat in a tree-heavy campus like Frensham School. 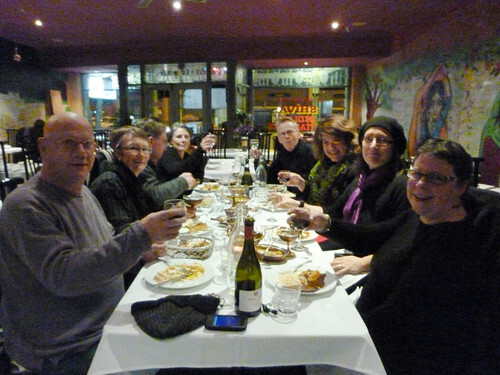 One night a few of us went out to dinner and gorged ourselves on yummy Indian food as a break from the (actually quite nice) food at the school. 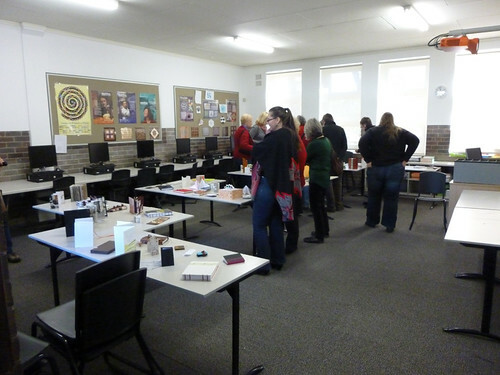 At the end, as usual, every class out on a display of their work, and I think our class really shone, mainly because they produced such an interesting array of pieces. If you'd like to see more images, I've made a flickr set here. Big thanks to all my students, and to everyone else who I had interesting conversations with over breakfasts, lunches and dinners, and to everyone who sat through my talk about my time in NZ :) Also big thanks to Dale and Mark, who pulled off another great school, and I highly encourage anyone who is interested to check out the website for the Summer School, and eventually the next Winter School. 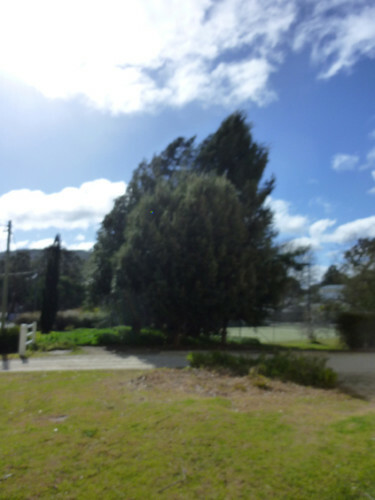 Heh, so much for being able to blog more while I'm here... on Tuesday we had a swelling of enormous winds that felled trees and disabled all sorts of amenities, including Optus, although Telstra survived, and so too did the electricity here at Frensham, but not in the rest of the town. Suffice to say that access has since been patchy, so it's been tricky to get to emails, let alone blog. We have be making some beautiful things, and making nice connections, and I have been taking photos. So all going well, I will share on the weekend. Breakfast time, not that I need any more food in my life! Have been eating more than I need to, and moving not enough. So here I am, sitting cross-legged on a single bed in a two-girl dorm in a boarding house. Flip back -- bejeesus -- TWENTY-SEVEN years, and you'd find me doing the same thing. Except that at 9:52pm it would have been lights out ages ago, and I wouldn't have had a small quantity of alcohol to make the boarding experience that much fuzzier. Or maybe I would have, I can't remember minute details of that time, but I do know that I had a very naughty roommate, so smuggled alcohol wouldn't have been out of the question. There's fresh white linen on the bed, and besides me and the bed, and the other bed, there's also two of the following: desk, chair and wardrobe, but only one bedside table, which is actually next to the door. It's not a big room, so there's not more floor space. The girls must have to climb over each other to get around. The radiator was on full-bore when I first came into the room (which I bet never happens when the girls are here), but now that I've turned it off and opened the window, the room is quite a good temperature. 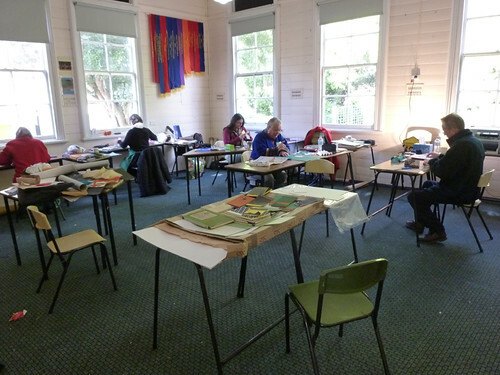 I'm in Hartfield House at Frensham School in Mittagong, NSW, and I'm here to teach a class at the Sturt Winter School fulltime for the week. I've unpacked, had my induction and my dinner of butter chicken curry followed by pancakes & icecream (I made a joke to the guy in the kitchen that I was here to gain weight, and he replied that it was his job to make sure I gained weight, so I'm doomed), and even watched a movie in the drama theatre (Up in the Air, with the delectable George Clooney and the even more gorgeous Vera Farmiga). Speaking of films, Bumblebee and I had a date this morning to see Super 8, which I highly recommend. What a ride of a movie! We laughed, we jumped, we cried (well, I did), we laughed again. Like E.T., mixed with something a touch scarier and funnier. Suitable for 10+, probably not any younger. Yesterday Colonel and Lady Duck visited, with my lovely little nana, who has moved in with them after a couple of those age-defining health incidents that leave you unable to live alone anymore. They brought her up to see our new house, and to visit a plaque that's been put in the war section of the local cemetary for my grandfather. I tell you, if I could be half the jolly little old lady my nana is when I'm that old, I'll be happy. She's inspirational. She was touched to see a few of her Precious Things around my house: a set of mugs she'd passed on to me years ago, a lovely wooden standing lamp, a painting my grandfather painted. We always think of inheriting things when people die, but it can be nice know while you're still alive that your descendants treasure the things you love. Anyhoo, here I am, loving the Sturt experience, but wishing I didn't have to feel so bloody prefect-ish, sitting on my school blanket on my school bed. I've got a full class tomorrow, and one of my students is a fellow ANCA artist, who always said she wanted to do one of my classes... I never think those statements are real, but she meant it! She's a lot of fun, so I'm looking forward to tomorrow even more. As you can tell, I've got internet access with my trusty dongle, so I'll try to blog a bit this week, and share some photos of the class's progress. Right now though, it's lights-out, otherwise I'll be a grumpy tutor.